Food & Watch Watch has analyzed the USDA’s regulatory sampling for Salmonella bacteria in the country’s poultry slaughter plants, and has found that more contaminated chicken is being produced. Thirty percent of plants operating under the new privatized system have failed the performance standard for that pathogenic bacteria. 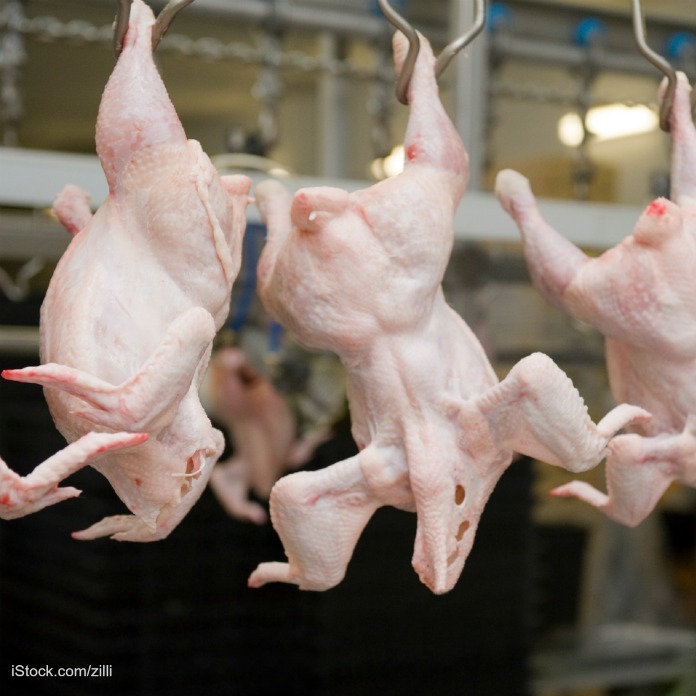 The New Poultry Inspection System (NPIS) removes USDA inspectors from slaughter lines. Company employees are now responsible for inspections, under this system. Just one USDA inspector is on each line, and that person must inspect three birds per second. The final rule, proposed in 2012, was published in 2014. USDA argued that this inspection system would reduce the incidence of Salmonella contamination. Wenonah Hauter, executive director of Food & Watch Watch, said in a statement, “It’s clear that this privatized inspection system that was hyped as an improvement to food safety certainly isn’t. In fact, it has higher rates of contamination than slaughterhouses with more government oversight. This does not come as a surprise.” This week, the National Chicken Council’s petition to lift the cap on chicken line speeds was denied. Food & Watch Watch had to file a Freedom of Information Act request to see this data. They compared that list with the Salmonella verification testing results that were posted last week. Thirty percent of the 43 NPIS plants failed the performance standard. Only 13% of the non-NPIS plants failed the standard. One of the plants that failed had obtained a waiver on line speed, so they could run the slaughter line at 175 birds per minute. You can see the list of plants that failed at Food & Watch Watch’s web site. USDA wants to expand this inspection model to hog slaughter plants. In addition, there would be no line speed caps on hog slaughter. Food & Watch Watch opposes this rule.